Tags: "Annie's Blue Ribbon General Store", "glacier park throw", "pendleton mills"
FRANKENSTORM is coming you guys!!! OK, maybe. Whether or not The Perfect Storm really will cause anything major remains to be seen, but that won’t stop most of us from stocking up and digging in for some serious hibernation this weekend. And the perfect accessory is our delicious new Glacier Park Throw! This is sooooo on my Want List. From the legendary Pendleton Mills, the Glacier Park Throw is luxurious feather-weight Merino wool, and trust me–it is heaven! Tags: "Annie's Blue Ribbon General Store", "Banana Saver"
I carry our Banana Saver every day and use it constantly. It seriously hold ( and protects) every size and shape banana I’ve ever put in there. Nothing drives me bonkers like a bruised banana. Coco loves bananas, I love bananas and of course my Big Gorilla is bananas for bananas. 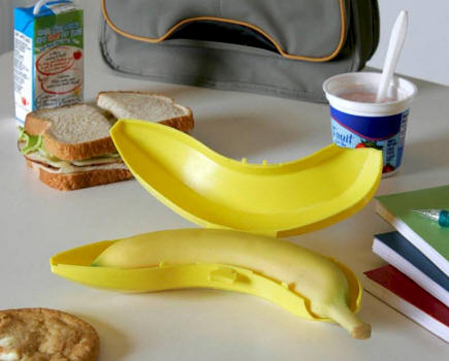 Lately I’ve noticed a crazy phenomenon though: strangers stop me on the street and ask me where I got it, friends demand I sell them mine, out of town friends (most recently from Turkey) text me to say WE NEED BANANA SAVER! Or more correctly, two. Most people seem to buy them in pairs, maybe to give one to a friend who would also appreciate it? Anyway, get yours now! Banana Savers– $6. Frasier Fir is Here and selling FAST! Tags: "Annie's Blue Ribbon General Store", "Frasier Fir Candles"
It’s that time of the year– FRASIER FIR time! We have loaded up on all sorts of yummy candles with everyone’s favorite cold weather scent. Besides the updated version of the single poured candle, above, we also have them in Tins, in Pinecones, in Votives, in 3 Packs (give 2 & keep one!, wrapped in a pretty decorative box, you name it. Stock up now, they are going FAST! 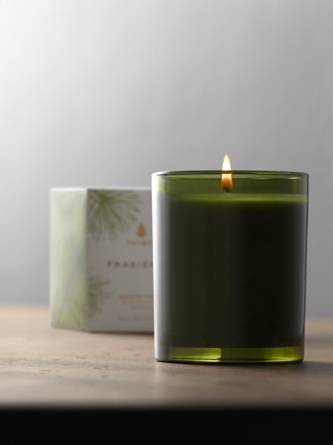 Frasier Fir Single Pour Candle– $26. Let’s take Halloween to the EXTREME! Tags: "Annie's Blue Ribbon General Store", "extreme pumpkins", "halloween", "pumpkin carving"
Do you have your pumpkins carved yet? If not, our book Extreme Pumpkins can help you create the most creative and terrifying pumpkins on the block. Filled with such sage advise as using glow sticks to give a radioactive pumpkin a spooky green glow, this book will take your pumpkins up a notch. We also have all your carving tools, including glow-in-the-dark paint! Tags: "Annie's Blue Ribbon General Store", "library card mini books"
There’s something so beautiful and nostalgic about library borrower cards. As a kid (when these things were still used) I loved to look at all the previous borrowers and see if I knew anyone. So of course, I love these mini notebooks hand-made from library cards. They’re perfect for carrying in your purse or pocket, and also make a great gift. It’s not too early to start thinking about stocking stuffers!! Set of 5 books in assorted colors with pencil. Each book measures 2″ x 3″. $12. How do the Presidents Stack up? Tags: "Annie's Blue Ribbon General Store", "Presidential Block Set"
No matter what your party affiliation these Presidential Blocks will make learning all the Presidents FUN! 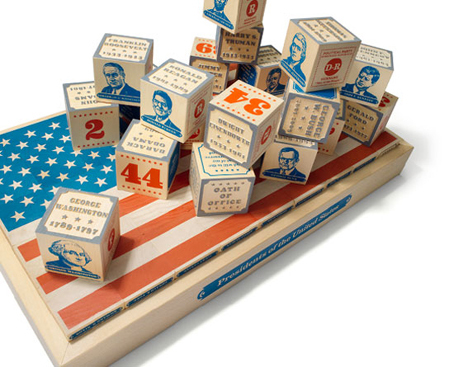 These All American Blocks will help you stack up the Presidents one by one. Also includes an “Oath of Office” block so that aspiring future presidents can be sharp on their big day.Presidential Block Set– $100. Tags: "Annie's Blue Ribbon General Store", "Boca Raton Observer", "Tarot Card Plates"
We are excited to be part of a new publication for us- The Boca Raton Observer– yay! Are you out there Florida peeps? They dig our Halloween goods, especially our Tarot Card plates. We’ve got lots of fun & frightening Halloween Ideas online- check it out here. 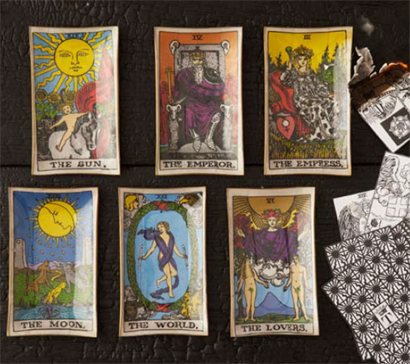 Tarot Card Plates– $60 for a set of 6.